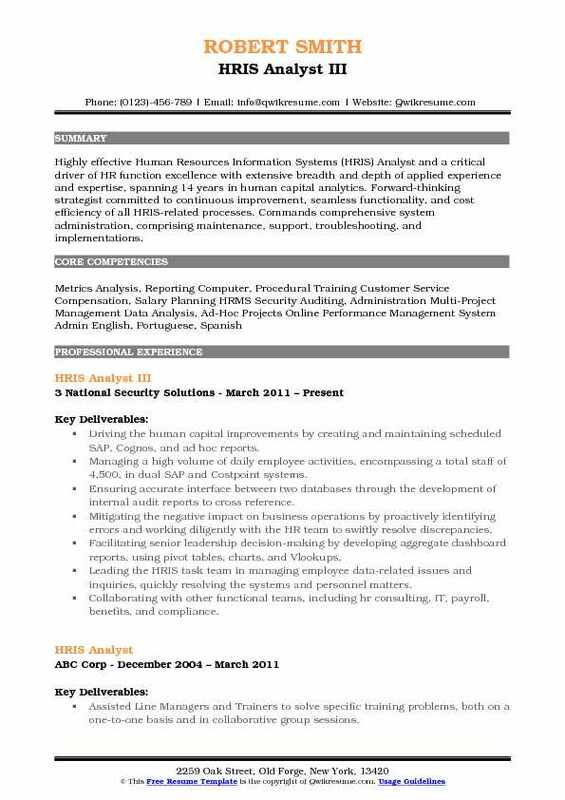 An HRIS Analyst evaluates, analyzes and maintains the Human Resource Information System – HRIS of the company. Even though there are many other job responsibilities, the chief task for an HRIS Analyst includes – assist and identify new HR needs, develop software products, alter existing programs, gather reports and come up with innovative solutions whenever needed. 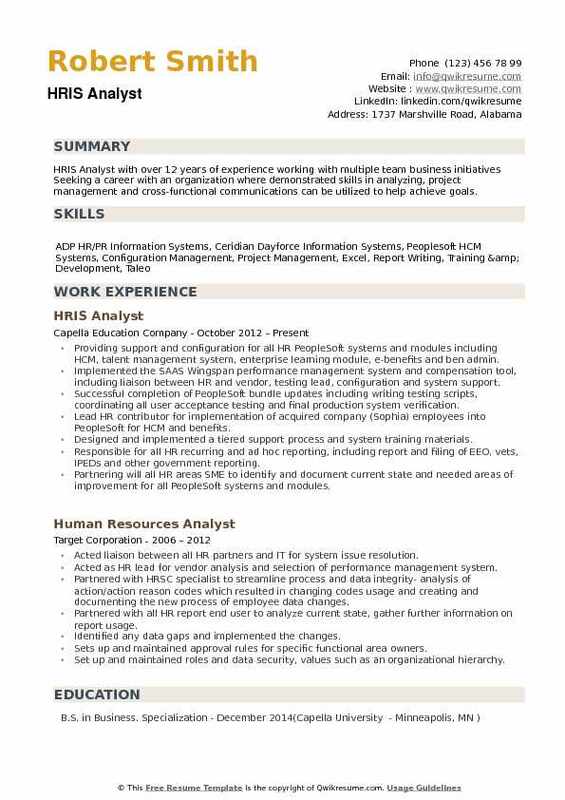 An HRIS Analyst being an IT arm for the HR field should be capable enough to take charge of the databases, software and computer system of the company. They have to maintain a permanent data of various human resources like time off, payroll, benefits, and staff records and so on. As this information is highly personal, the HRIS analyst should maintain a high level of security to protect and safeguard the data. 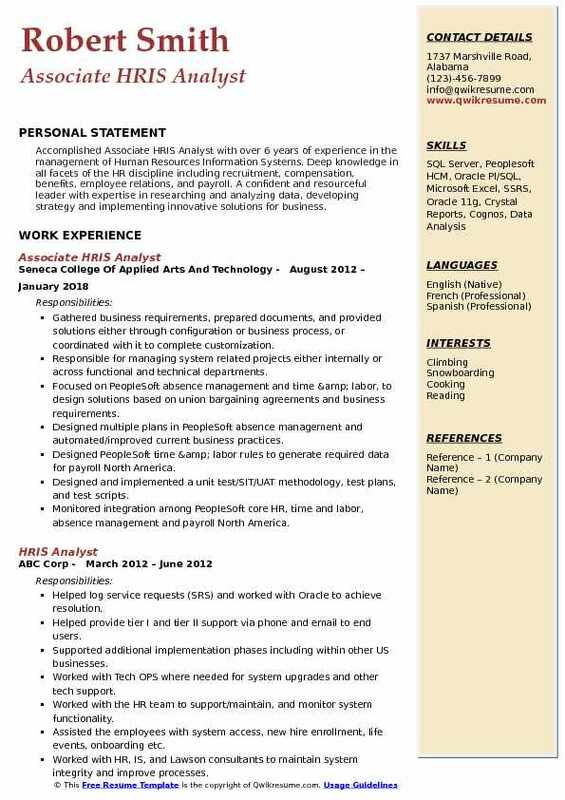 Individuals with a Bachelors degree in Computer Science, Statistics, Math, and other related fields can seek for this job post, but an HRIS Analyst Resume sample with a Masters degree in Human Resource gets into the limelight and produce better chances to grab a senior level entry for this post. Partnering with IT professionals to maintain the optimal interface between timekeeping system and payroll software. Managing and maintaining the in-house performance and compensation programs and provide senior leadership with requested analytical data to make informed decisions. Identifying processes for improvement, create procedures, implement change management and train users. Researching systems and host meetings with potential HRMS software vendors and make recommendations to senior leadership. Communicating the payroll and timekeeping changes and updates with Supervisors and Managers. Troubleshooting factory timekeeping system to identify and resolve errors. Customizing HR, Payroll, and Benefit Systems to meet the processing requirements of the hr department. Partnering with vendors to create benefit file feeds and integrate hr systems with 3rd party software. Managing HRIS team, including performance management, time and labor and HRIS related escalations. Objective : To secure a position as a valued member of your Human Resources department that leverages my analytical thinking, problem-solving, energy, and talent to achieve the overall corporate goals. Experience specializing in HR best practices, Recruiting, HRIS and Talent Acquisition. Responsible for evaluating, analyzing, supporting and maintaining the Human Resources Information Systems (HRIS). Supporting the organization’s mission by striving for excellence in all aspects of their job with a focus on positive interpersonal relationship with co-workers. Performing data entry, maintaining the HRIS and facilitates data accuracy across the system. Recommending the process and product improvements and innovative solutions for continual improvement. Providing the functional and technical training to end users for system upgrades and enhancements. Advanced computer skills with strong understanding of HRMS database design, structure, functions and processes, and experience with database tools. Responsible for all employee medical involving compliance, physicals, annual testing & records. Running, maintaining and supporting the various reports and queries for the HR department and agency-wide distribution. Summary : A proactive, tactical HRIS Analyst and Global Mobility Professional, with a comprehensive understanding of Human Resource processes, HRIS Technology, System Applications, U.S. Visa and Foreign Immigration procedures. An effective, well-rounded problem solver with 9 years of experience in HR/Operations/Staffing and Corporate Global Mobility. Highly customer focused, organized and detail-oriented. Well developed administrative, analytical, interpersonal and communication skills. Responsible for maintaining functional development of the 9.1 Oracle/Peoplesoft system. Providing global support for applications, implementation and reporting tools using PeopleSoft v9.1. Maintaining multiple tables within the PeopleSoft system to ensure data integrity. Processing requests in InfoPath for department creation/organization structure/supervisor changes. Resolving the second/third tier escalations from HRIS-helping desk/payroll/ internal HR/ comp/benefits. Assisting the Sr.Analysts with numerous projects and system process changes. Entering and maintaining all expat assignment data into the global assignment module in PeopleSoft. Working with global HR-BPS to facilitate international assignment start/end dates in PeopleSoft. Updating and creating the job function and subfunction codes in the job code table. Member of the global project team for implementation of global oracle cloud hcm system, to include performance, ess/mss modules. 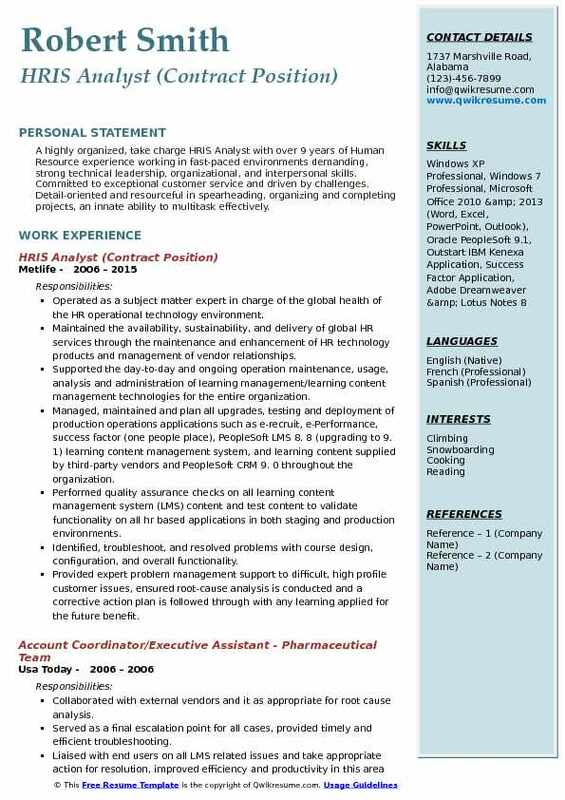 Headline : HRIS Analyst with 5 years of experience wants to partner with Employee Relations, IT, Payroll, and Recruiting to provide a satisfying end-user experience through the use automated technologies designed to reduce errors, save time, and eliminate the need for paper forms. Primary point of contact for system configuration, enhancements, data discrepancies, and production support. Troubleshooting interfaces that import and export data from the applicant tracking system (ICIMS) and payroll (ADP). Authoring RFC (Request For Change) documents to be circulated within the IT dept for all system changes that could have a potential impact on upstream or downstream systems. Creating and assigning the custom security roles tailored to each user (or department) and designed to protect sensitive employee data. Designing, maintaining and optimizing the HR self-service workflows for Manager and employee business processes. Creating the training videos, procedures, and quick reference guides for hr self-service training. Managing the positions through the build of job codes, position codes, and DPPs (Default Position Profiles). Configuring and maintaining the employment actions for use within the application. Managing the availability of HR reports and access to the hr/payroll query tool based on user business needs. Summary : A highly organized, take charge HRIS Analyst with over 9 years of Human Resource experience working in fast-paced environments demanding, strong technical leadership, organizational, and interpersonal skills. Committed to exceptional customer service and driven by challenges. Detail-oriented and resourceful in spearheading, organizing and completing projects, an innate ability to multitask effectively. Operated as a subject matter expert in charge of the global health of the HR operational technology environment. Maintained the availability, sustainability, and delivery of global HR services through the maintenance and enhancement of HR technology products and management of vendor relationships. Supported the day-to-day and ongoing operation maintenance, usage, analysis and administration of learning management/learning content management technologies for the entire organization. Managed, maintained and plan all upgrades, testing and deployment of production operations applications such as e-recruit, e-Performance, success factor (one people place), PeopleSoft LMS 8. 8 (upgrading to 9. 1) learning content management system, and learning content supplied by third-party vendors and PeopleSoft CRM 9. 0 throughout the organization. Performed quality assurance checks on all learning content management system (LMS) content and test content to validate functionality on all hr based applications in both staging and production environments. Identified, troubleshoot, and resolved problems with course design, configuration, and overall functionality. Provided expert problem management support to difficult, high profile customer issues, ensured root-cause analysis is conducted and a corrective action plan is followed through with any learning applied for the future benefit. 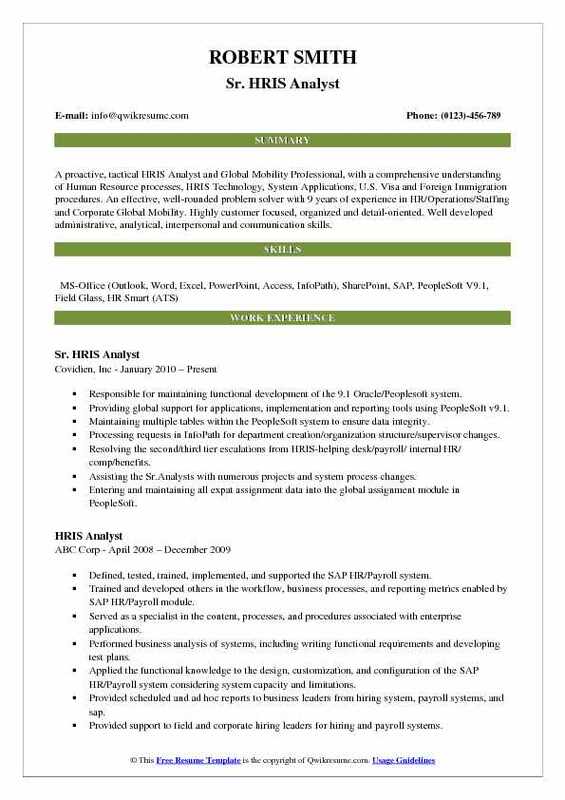 Summary : Accomplished HRIS Analyst II with 15+ years solid HRIS, Report Writing and Application Support experience. Intermediate/Advanced Excel expertise (Vlookups, pivot tables, data imports/exports, etc.). 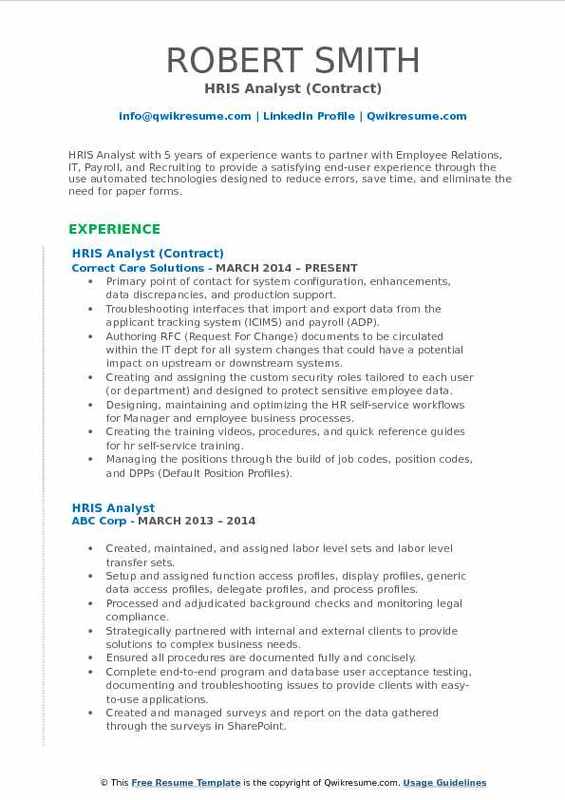 Exceptional analytical and troubleshooting abilities. Passion for discovering creative solutions in order to maximize process efficiencies. Foster and maintain positive relationships with all levels of Management and Staff. 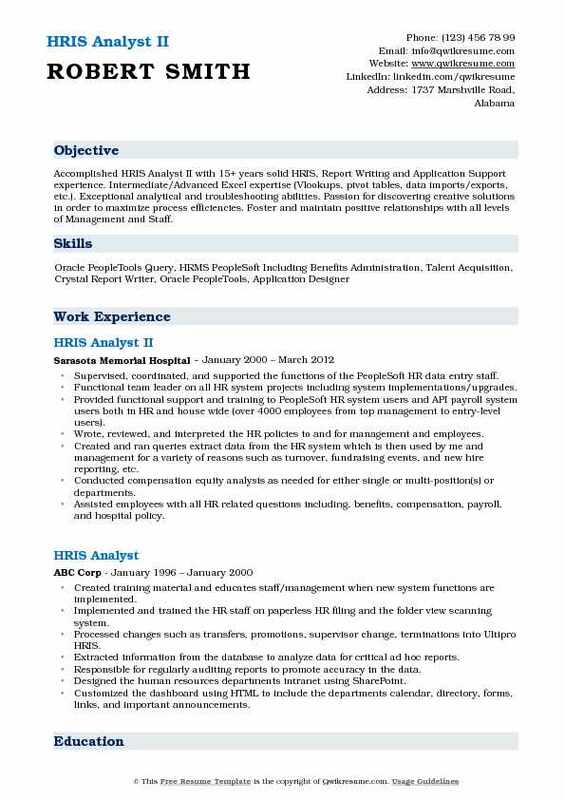 Supervised, coordinated, and supported the functions of the PeopleSoft HR data entry staff. Functional team leader on all HR system projects including system implementations/upgrades. Provided functional support and training to PeopleSoft HR system users and API payroll system users both in HR and house wide (over 4000 employees from top management to entry-level users). Wrote, reviewed, and interpreted the HR policies to and for management and employees. Created and ran queries extract data from the HR system which is then used by me and management for a variety of reasons such as turnover, fundraising events, and new hire reporting, etc. Conducted compensation equity analysis as needed for either single or multi-position(s) or departments. Assisted employees with all HR related questions including, benefits, compensation, payroll, and hospital policy. Assisted with annual benefit open enrollment and flexible spending account open enrollment. Periodically audited the HR system to ensure the information is entered into PeopleSoft HRMS is accurate. Objective : HRIS Analyst experienced Professional who has worked on diverse HR systems and process flows, with Full SDLC implementation cycle experience. Diverse industry experience and spectrum of HR systems like SAP Human Capital Management, Halogen Performance, Kronos Time & Attendance System, ADP Benefits and Payroll systems and Oracle Taleo Cloud Solutions. HR SME and liaison with other HR business owners, internal IT resources, and external vendors. Responsible for the distributed hr systems and data flow within the organization and making sure that HR data integrity is maintained within the workflow. Leading the upgrade project from ADP 2.0 to the current version of ADP workforce now for benefits and payroll departments highlighting my leadership and expertise in my workspace. 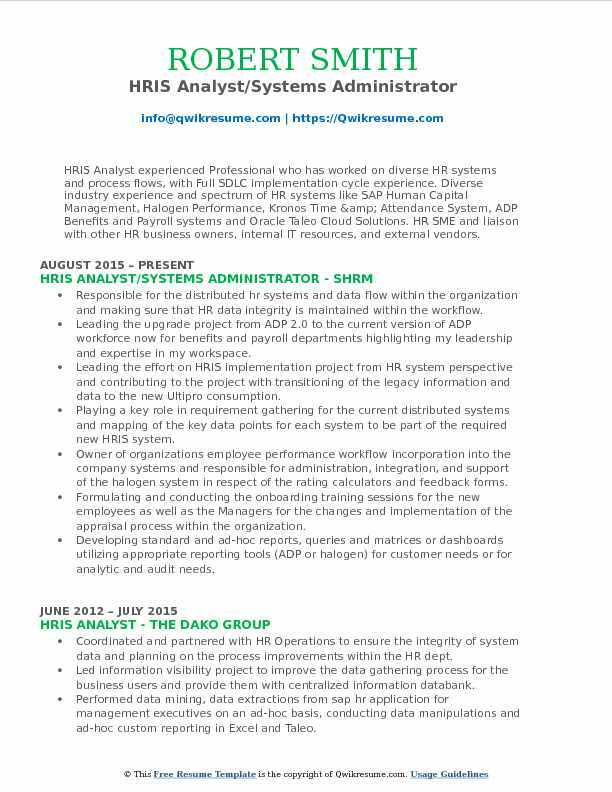 Leading the effort on HRIS implementation project from HR system perspective and contributing to the project with transitioning of the legacy information and data to the new Ultipro consumption. Playing a key role in requirement gathering for the current distributed systems and mapping of the key data points for each system to be part of the required new HRIS system. Owner of organizations employee performance workflow incorporation into the company systems and responsible for administration, integration, and support of the halogen system in respect of the rating calculators and feedback forms. Formulating and conducting the onboarding training sessions for the new employees as well as the Managers for the changes and implementation of the appraisal process within the organization. Developing standard and ad-hoc reports, queries and matrices or dashboards utilizing appropriate reporting tools (ADP or halogen) for customer needs or for analytic and audit needs. Summary : Highly effective Human Resources Information Systems (HRIS) Analyst and a critical driver of HR function excellence with extensive breadth and depth of applied experience and expertise, spanning 14 years in human capital analytics. Forward-thinking strategist committed to continuous improvement, seamless functionality, and cost efficiency of all HRIS-related processes. Commands comprehensive system administration, comprising maintenance, support, troubleshooting, and implementations. Driving the human capital improvements by creating and maintaining scheduled SAP, Cognos, and ad hoc reports. Managing a high volume of daily employee activities, encompassing a total staff of 4,500, in dual SAP and Costpoint systems. Ensuring accurate interface between two databases through the development of internal audit reports to cross reference. Mitigating the negative impact on business operations by proactively identifying errors and working diligently with the HR team to swiftly resolve discrepancies. Facilitating senior leadership decision-making by developing aggregate dashboard reports, using pivot tables, charts, and Vlookups. Leading the HRIS task team in managing employee data-related issues and inquiries, quickly resolving the systems and personnel matters. Collaborating with other functional teams, including hr consulting, IT, payroll, benefits, and compliance. Replaced a paper-based EAN system, comprising over 5,000 annual submissions, and significantly reduced EAN processing. Selected by the executive team to lead testing and training for a major sap implementation. Orchestrated project planning. 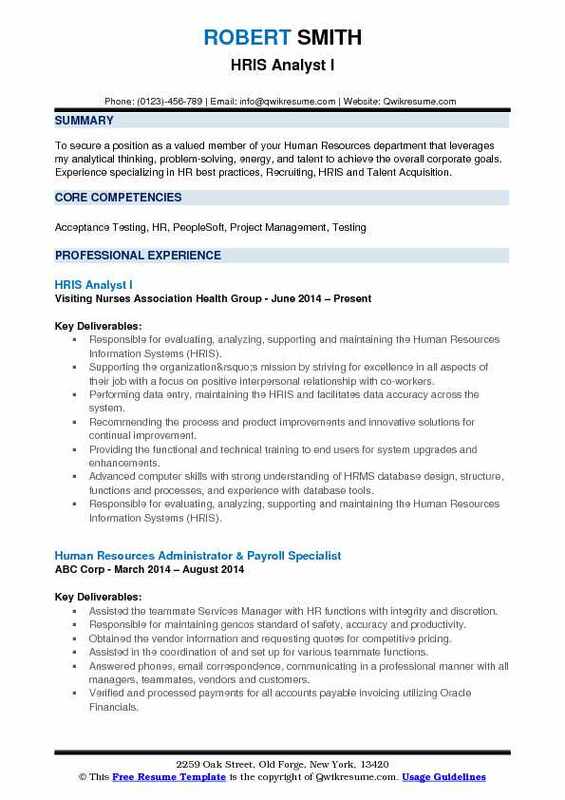 Headline : Accomplished Associate HRIS Analyst with over 6 years of experience in the management of Human Resources Information Systems. Deep knowledge in all facets of the HR discipline including recruitment, compensation, benefits, employee relations, and payroll. A confident and resourceful leader with expertise in researching and analyzing data, developing strategy and implementing innovative solutions for business. Gathered business requirements, prepared documents, and provided solutions either through configuration or business process, or coordinated with it to complete customization. Responsible for managing system related projects either internally or across functional and technical departments. Focused on PeopleSoft absence management and time & labor, to design solutions based on union bargaining agreements and business requirements. Designed multiple plans in PeopleSoft absence management and automated/improved current business practices. Designed PeopleSoft time & labor rules to generate required data for payroll North America. Designed and implemented a unit test/SIT/UAT methodology, test plans, and test scripts. Monitored integration among PeopleSoft core HR, time and labor, absence management and payroll North America. Responsible for administrating PeopleSoft approval wok engine (awe), and debugging issues. Provided various routine and ad-hoc reports by using Oracle browser, SQL developer and Excel. 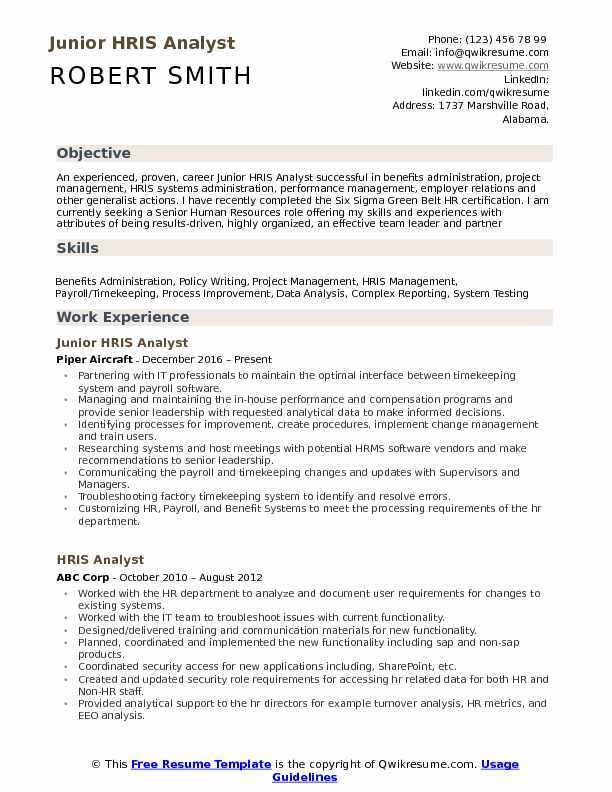 Summary : HRIS Analyst with over 12 years of experience working with multiple team business initiatives Seeking a career with an organization where demonstrated skills in analyzing, project management and cross-functional communications can be utilized to help achieve goals. Providing support and configuration for all HR PeopleSoft systems and modules including HCM, talent management system, enterprise learning module, e-benefits and ben admin. Implemented the SAAS Wingspan performance management system and compensation tool, including liaison between HR and vendor, testing lead, configuration and system support. Successful completion of PeopleSoft bundle updates including writing testing scripts, coordinating all user acceptance testing and final production system verification. Lead HR contributor for implementation of acquired company (Sophia) employees into PeopleSoft for HCM and benefits. Designed and implemented a tiered support process and system training materials. Responsible for all HR recurring and ad hoc reporting, including report and filing of EEO, vets, IPEDs and other government reporting. Partnering will all HR areas SME to identify and document current state and needed areas of improvement for all PeopleSoft systems and modules. Making recommendations to HR leadership on system enhancements and replacement.